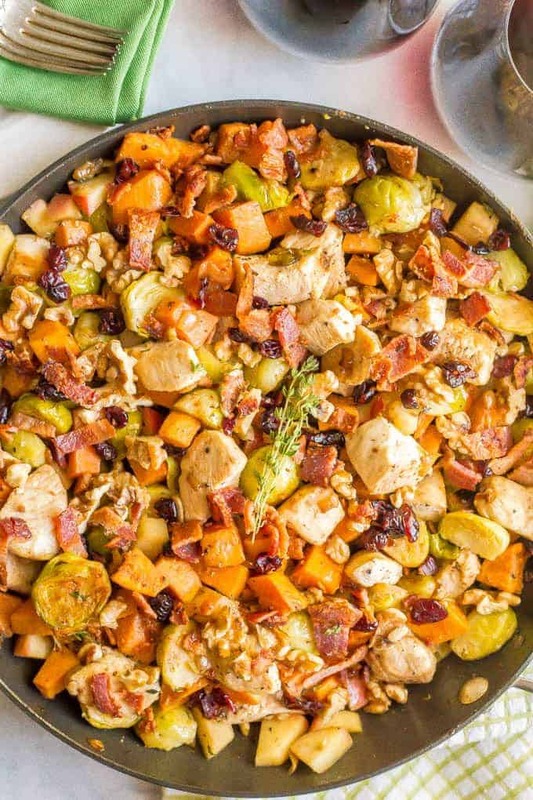 One-pot easy harvest chicken skillet with sweet potatoes and Brussels sprouts is a beautiful and delicious recipe that’s perfect for a fall dinner! Are you ready for the big meal? Do you have your recipes collected, your grocery list finalized, your game plan in place? Since I’m hoping you’re all squared away for Thanksgiving, today I’m just bringing you a bountiful beauty of a skillet with ALL my favorites packed in there! This month’s recipe Redux is for naturally colored holiday fare, which you know I’m all about! 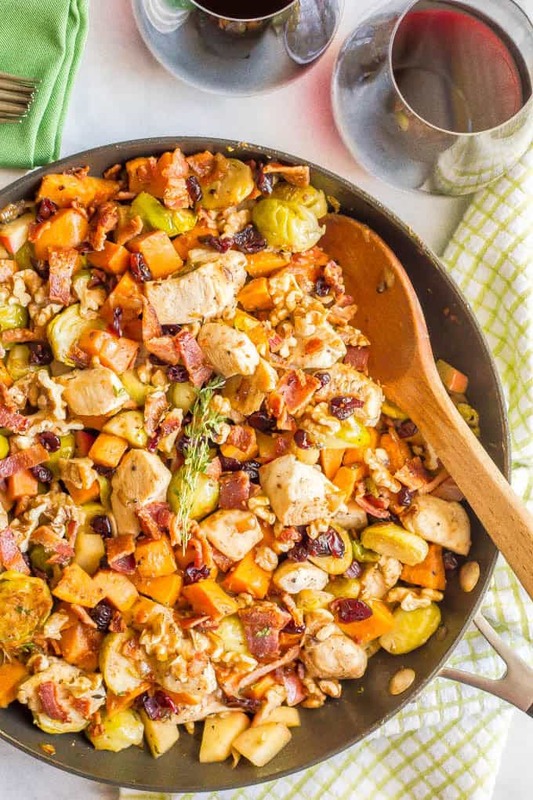 So let’s celebrate all the gorgeous autumn flavors and colors with this beautiful, one-pot easy harvest chicken skillet. 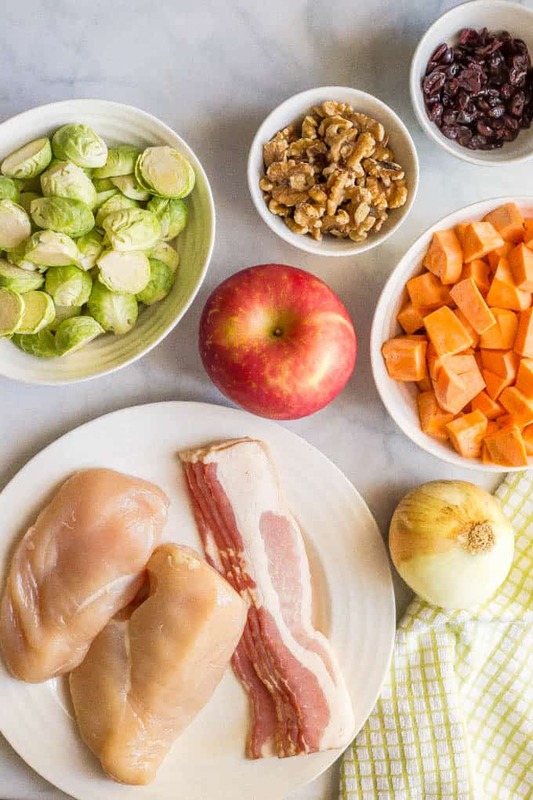 We’ve got bacon and chicken and sweet potatoes and Brussels sprouts and apples and walnuts and dried cranberries and some warm spices. I mean, why not right? I guess it’s a trend with me. 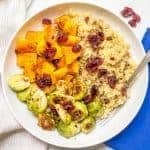 My harvest rice salad is a similar combo of my favorites, as is my quinoa bowl with butternut squash and Brussels sprouts. 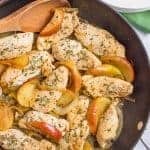 We’ve got some similar flavors in this recipe but it’s made more hearty with the chicken as a main meal. And the bacon of course! 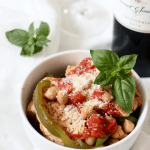 I am so in love with this combo – I’ve made it for dinner three times already this month! Super tasty! 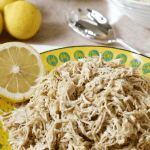 I cook the chicken for this recipe but you could use leftover rotisserie chicken or leftover Thanksgiving turkey and just add it at the end to warm through. It would make it faster! If you don’t use bacon (gasp! ), you can substitute 2 teaspoons of extra-virgin olive oil. You can substitute pecans for the walnuts – or your favorite nut. I always use fresh thyme but you could substitute dried thyme. I’d add it with the cinnamon and nutmeg and you’ll only need 1 teaspoon. 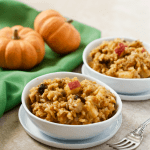 You could also try this with some fresh or dried rosemary – another great fall flavor! 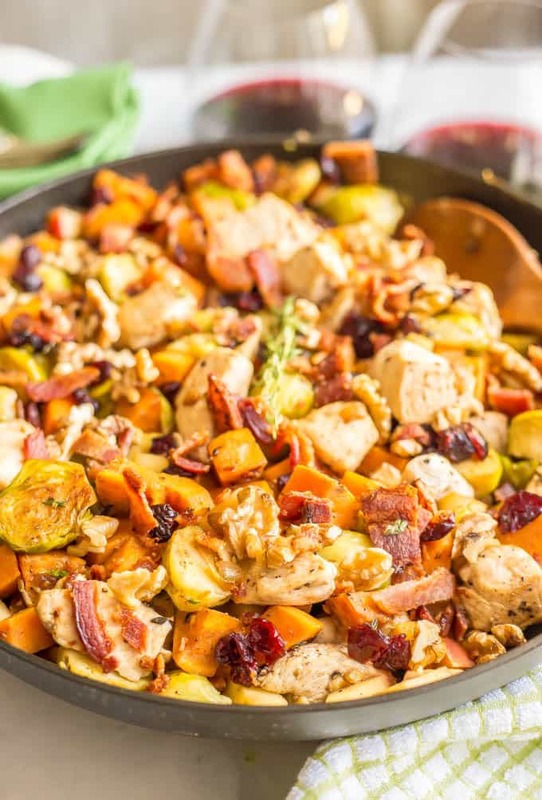 One-pot easy harvest chicken skillet is a beautiful and delicious recipe that’s perfect for a fall dinner! Heat a large skillet over medium heat. Add bacon and cook until cooked through, flipping as needed, about 10 minutes. Remove, leaving the bacon grease in the pan. Crumble and reserve the cooked bacon for later. Add the onion to the pan with the bacon grease and sauce until tender, about 4-5 minutes. Add garlic to the pan and cook for an additional 30 seconds. Add chicken pieces to the pan and season with half of the salt and pepper. 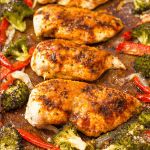 Cook chicken until browned on both sides and cooked through, about 8 minutes. Remove to a plate, cover and keep warm. If the pan is dry, add 1 tablespoon olive oil. 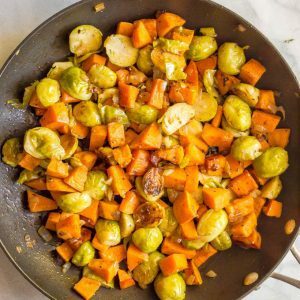 Add sweet potatoes, Brussels sprouts, cinnamon, nutmeg and remaining salt and pepper. Stir to combine and cook for 3-4 minutes to allow the vegetables to brown. 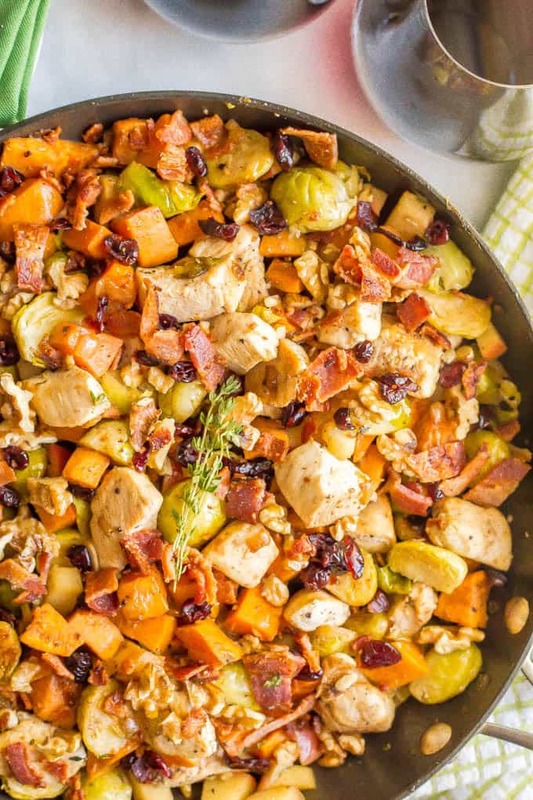 Once the vegetables are tender, stir in cooked chicken, walnuts, dried cranberries and thyme and mix for 2-3 minutes, until everything is warmed through. Season to taste with additional salt and pepper and serve with reserved, crumbled bacon. You can substitute pecans for the walnuts - or your favorite nut. 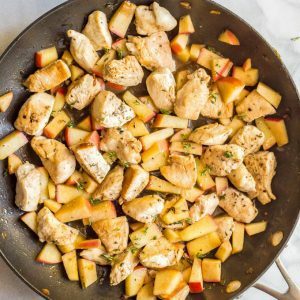 You could also try this with some fresh or dried rosemary - another great fall flavor! Love the simplicity of this nutritious and hearty dish! 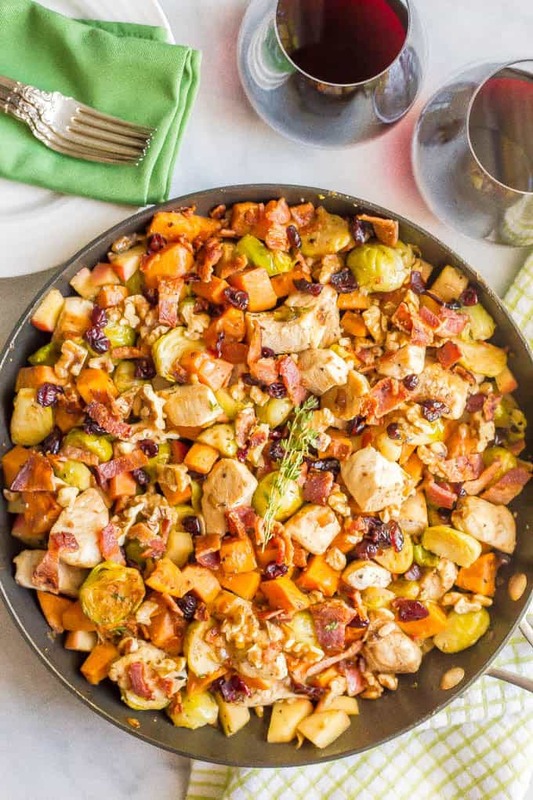 The flavors sound perfect for the holiday season and the skillet looks delicious! Such invinting colors! A beautiful recipe, I am sure I would love it, only ingredients I like. Have a nice Thanksgiving with your family! It’s some of my very favorites in here! I hope you try it Adina!